You are here: Home / Good News / Nasty Surprise: My New 2012 Chevrolet Volt! This is the second of three installments regarding my new 2012 Chevrolet Volt. If you would care to read the previous post, it’s located here. After a test drive and a haggling session, I returned from the dealership to wait for the delivery of my new car from Brunswick, Georgia. Just before closing time, I got their call. My new car had arrived! By the time I got to the dealership, I had to wait for a few minutes for them to finish detailing the vehicle. Then, it was driven around to the front of the dealership where I stood waiting. It looked great from the side, but when he nosed it into a parking space directly in front of me, my jaw dropped open. The dealership in Brunswick had taken the liberty to install a vanity license plate frame smack dab in the middle of the front bumper. This TOTALLY ruined the look of the front end of the car. 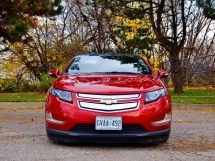 I could not find a photograph of a silver Volt (the color I chose), but the vanity plate mounted to this red Volt gives you the idea. My salescreature was also horrified. He fell to his knees in front of the car and began unscrewing the four bolts that held the plate to the bumper. Once they were removed and the plate dropped to the concrete, there they were–four holes drilled straight through the bumper. As you can imagine, much discussion ensued. At first they were going to order a new bumper to replace the one that had the holes. But then we had another surprise. This car did not come equipped with a rearview camera. More discussion followed. They assured me that they could install a review camera, but it would display in the rear view mirror INSTEAD OF the navigation screen. I stood my ground. This was not the vehicle that I wanted. To make a long story short, as they say, I was allowed to drive home in this new Volt while they continued to search for exactly the vehicle that I had wanted in the first place. It took them about three days, but they finally located one at a dealership in Macon, Georgia. When the vehicle arrived, I went in and inspected it, agreed that it was fine, and we exchanged cars. I have to say that I’ve never had that experience at ANY dealership before. Normally, what you drive off the lot with, you are stuck with. But, certainly not in this case! I thought I would have room in this post to finish my account of the Chevrolet Volt, but I have enough left to say about it that I think I will save that for next Tuesday.